The other day, I was with my family at the tide pools near Sandy Beach during a particularly rough afternoon, only to notice a couple determined to jump-off the rocks into the frothing water below. Frankly, I couldn’t believe my eyes. So much so, that I began to yell at them, “DON’T JUMP!” Long story short: they did anyway, nearly killing themselves when the waves pounded them against the jagged, hardened lava. Believe it or not, this was a local couple who knew all about the dangers of leaping into rough waters near lava rock outcroppings. And, yet, there they went! Seems we’re all programmed to want to try “daring” and “scary” things, especially in an intriguing place like Hawaii. But, all too often, they lead to accidents, some of them deadly. That’s exactly what’s prompted Hawaii officials to recently take aim at a man-made Big Island water slide, which has recently become a tourist-attraction in its own right. According to Hawaii News Now, it’s known as the White Road hike, for its starting point in Waimea. Apparently, lots of visitors are now taking the two-hour hike into upper Waipio Valley for the payoff: A 30 foot-long irrigation flume that visitors use as a water slide. 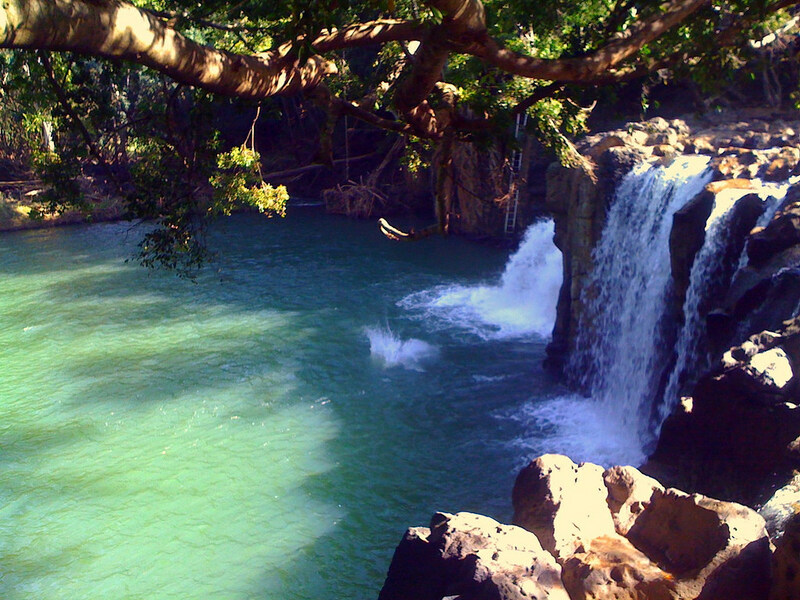 Kipu Falls on Kauai was once a big tourist draw, but the landowner put a fence around the trailhead because of too many accidents. “We need to discourage this as much as we can when people are saying things to appeal to a visitors that may want to do a reckless type of experience,” Mufi Hannemann of the Hawaii Lodging and Tourism Association told the station. However, he admits that it’s hard to stop the word from spreading, especially with social media and the internet. Even the hike itself is dangerous. Hawaii News Now reports that the White Road hike traverses along a steep Waipio Valley ridge. The hike also involves crawling along irrigation pipes. Oh, and by the way, it’s also trespassing. 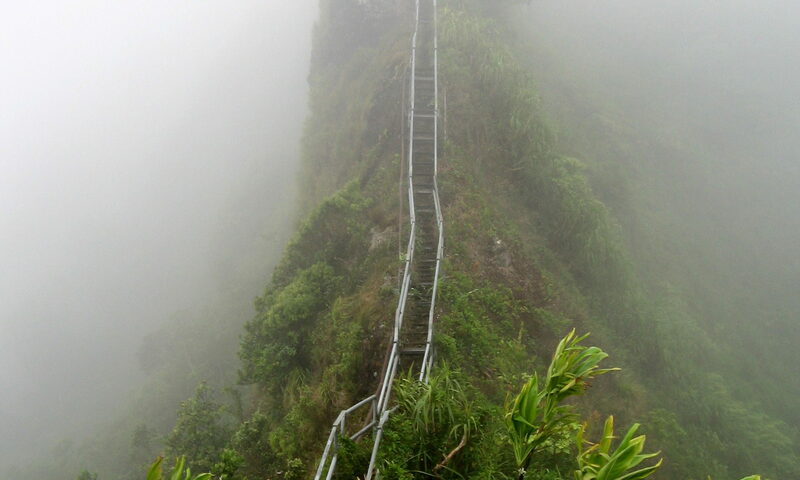 Officials had to close Haiku Stairs because of storm damage and the risk involved in climbing the stairs. The state Department of Land and Natural Resources told the news station that people cross into Department of Hawaiian Home Lands property and state conservation land, along with private property. Interestingly enough, locals seem perturbed by all the attention, but not because of the dangerous nature of the site. “There’s plenty other stuff to do that makes Hawaii a great place to visit than to take these risks and put yourself in harm’s way,” Hanneman told the station. So far, there have been no reports of injuries at the site. You may remember that hikers used to flock (illegally) to Kipu Falls on Kauai. But so many were hurt and killed that the private landowner built a fence around the trailhead. Best to stick to safe hikes, like the hike up to Diamond Head on Oahu. 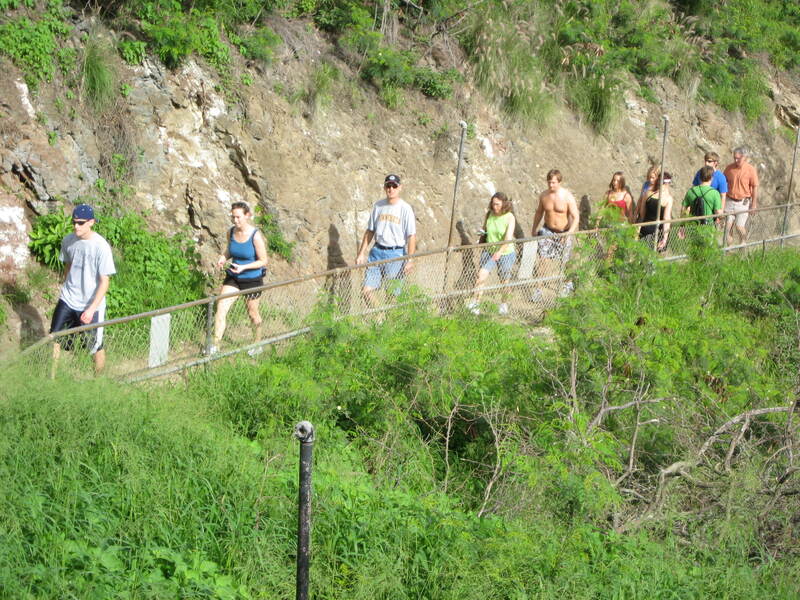 The state also recently removed Dead Man’s Catwalk and a swing atop the Haiku Stairs, both illegal hikes on Oahu. So, how does a visitor know which spots are safe and which are dangerous? This is where a little help comes in handy. By booking your excursions through a reputable tour company like Hawaii Aloha Travel, you can be assured a safe outing with minimal risk. For example, your knowledgeable tour guide will only take you to places he or she knows are safe to visit during an Oahu or Big Island Circle Island Tour. And, that goes for all Hawaii activities booked through Hawaii Aloha Travel. With all the fun and interesting things to see and do in Hawaii, it just isn’t necessary to risk your life trying something that could lead to an accident. Instead, enjoy a safe and fun vacation — away from the danger zones!